Book Review: “One Moment Can Change Your Life!” shares interesting personal tales. The exclamation point on the cover is not the only one. While reading Kellerer’s book, you will notice that he has a penchant for this particular punctuation mark, to the point where it can sometimes become distracting. It’s as if the author is at times incapable of stifling his excitement or disbelief in the telling of his subject’s stories, which becomes apparent not only through his use of punctuation, but from the dramatic tone of many of his retellings. “One Moment Can Change Your Life!” includes 13 unique stories taken from Kellerer’s interviews, book-ended by his own. While some stories are inherently more interesting than others, they all follow the same general concept of having one defining life experience. There are familiar accounts of addiction and narrowly avoided death, as well as one about a woman’s life during the end of World War II. A few of these stories–look out for a particularly interesting one about a man who is electrocuted atop a train car–are able to really hook the reader. However, because the nature of the book is to examine only these brief instances in a person’s life and their direct effects, many of the most interesting stories do not feel complete. There are a few that will leave you wishing you could learn more. It is clear that Kellerer has led an interesting life himself, and that his unique experiences make him an excellent choice for transcribing others’ stories. The problem, though, is that it is difficult for even the most accomplished writer to fully realize 13 unique voices when the stories are being relayed by the same author. Rather than a collection written by the individuals who lived each tale, this book is an amalgam of secondhand recordings where the individual voice and experience of each subject is not always easily distinguishable. Jack Canfield, author of the “Chicken Soup for the Soul” series of books that launched to mass popularity in the 1990s, has written an introduction for “One Moment Can Change Your Life!” that expounds on Kellerer’s impressive storytelling instincts. After a chance meeting at a seminar in Philadelphia, Canfield encouraged Kellerer to write based on the stories he told, and this book is the result. For those who loved Canfield’s series, you may find Kellerer a fitting substitute. The stories he shares often have the same uplifting and optimistic tone the “Chicken Soup for the Soul” books are well known for. 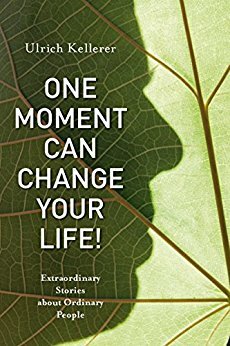 Ulrich Kellerer’s “One Moment Can Change Your Life!” runs just over 100 pages from start to finish. It is a quick and easy book and because many of the stories are only a few pages long, it is great for those looking for some light beach reading, or a book to take to bed. When you’ve finished, you will certainly come away with a few new perspectives and some interesting tales. Even if this book doesn’t change your life, you will not regret taking the time to read it. At a time when it is all too easy to insulate one’s self against varying ideas and perspectives, perhaps a book like Kellerer’s is just what we all need to open ourselves to the experiences of others. Check out Kellerer’s website and get a copy of “One Moment Can Change Your Life“.